Previous HIV-1 vaccine candidates have typically been limited to specific regions of the world. The experimental regimens tested in this study are based on 'mosaic' vaccines that take pieces of different HIV viruses and combine them to elicit immune responses against a wide variety of HIV strains. "These results represent an important milestone. This study demonstrates that the mosaic Ad26 prime, Ad26 plus gp140 boost HIV vaccine candidate induced robust immune responses in humans and monkeys with comparable magnitude, kinetics, phenotype, and durability and also provided 67% protection against viral challenge in monkeys", says Professor Dan Barouch, Director of the Center for Virology and Vaccine Research at Beth Israel Deaconess Medical Center and Professor of Medicine at Harvard Medical School, Boston, USA who led the study. He adds: "These results should be interpreted cautiously. The challenges in the development of an HIV vaccine are unprecedented, and the ability to induce HIV-specific immune responses does not necessarily indicate that a vaccine will protect humans from HIV infection. We eagerly await the results of the phase 2b efficacy trial called HVTN705, or 'Imbokodo', which will determine whether or not this vaccine will protect humans against acquiring HIV." To stimulate, or 'prime', an initial immune response, each volunteer received an intramuscular injection of Ad26.Mos.HIV at the start of the study and again 12 weeks later. 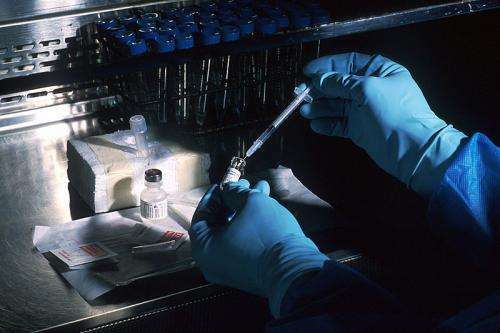 The vaccine containing 'mosaic' HIV Env/Gag/Pol antigens was created from many HIV strains, delivered using a nonreplicating common-cold virus (Ad26). Writing in a linked Comment, Dr. George Pavlakis and Dr. Barbara Felber from the National Cancer Institute at Frederik, Maryland, USA say: "Efficacy studies are necessary to determine protective ability in humans and also for the discovery of correlates of protection and for determining whether the same or different immune correlates apply for different vaccine regimens. It remains to be determined whether improved efficacy over RV144 will be achieved by either of the present efficacy trials (NCT02968849; NCT03060629). New vaccine concepts and vectors are in development and can progress to efficacy trials, which is an important process since development of an AIDS vaccine remains urgent. Despite unprecedented advances in HIV treatment and prophylaxis, the number of people living with HIV infection continues to increase worldwide. Implementation of even a moderately effective HIV vaccine together with the existing HIV prevention and treatment strategies is expected to contribute greatly to the evolving HIV/AIDS response. It is therefore essential that a commitment to pursue multiple vaccine development strategies continues at all stages." Does this mean that there will be mandatory HIV vaccinations for everyone? When the success will be complete, the financial question will be raised. It's not the moment yet.